T workers cleared Red Line tracks between Quincy Center station and Quincy Adams station on Monday. It could take 30 days to get the MBTA running back at full service, providing the area does not get hit with another major snowstorm, said Beverly Scott, the T’s general manager, at a press conference Monday. “As long as we don’t get hit with another storm like the last one, it will be back in 30 days,” she said Monday evening. More resources have been called in to help with the MBTA’s cleanup efforts, including federal emergency management services, and assistance from the Massachusetts Department of Transportation and from the Massachusetts Emergency Management Agency, Scott said. 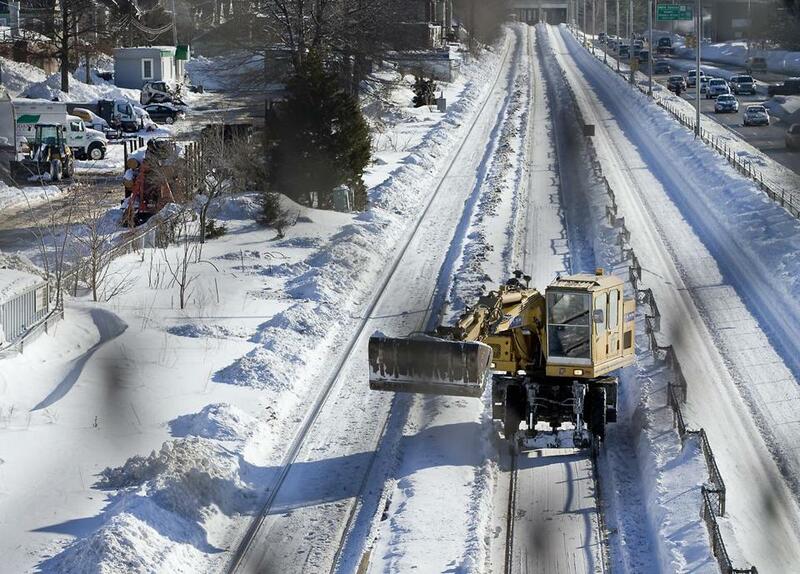 Massachusetts Bay Transportation Authority employees were working Monday to clear snow and ice from the tracks, with help from T union workers and inmates from the Department of Correction, according to MBTA spokesman Joe Pesaturo. Subzero temperatures were felt in the city on Monday. The MBTA is prioritizing which equipment and lines it clears by targeting those most frequently used and the areas that have been hit the hardest, she said. Projected service levels for Tuesday across the MBTA are expected to be limited, as they were on Monday. On Tuesday, Red Line trains will operate between the Alewife and Andrew stations. Limited bus service is being provided on the Ashmont and Braintree branches, according to Sean M. McCarthy, the MBTA’s chief operating officer. Fifteen Peter Pan buses were assisting MBTA shuttles between the Braintree and Andrew stations as of 9 a.m. Monday, Pesaturo said. He said the number of Peter Pan buses is expected to increase. Service will also be limited on the Orange Line Tuesday, with trains operating between the Sullivan and Back Bay stations only. Limited bus service will be provided, where service is suspended between the Oak Grove and Sullivan stations and between the Back Bay and Forest Hills stations, McCarthy said. On the Green Line, trains will be operating between Kenmore and Lechmere only, with limited trolley service on the D branch both ways, all the way to Riverside, McCarthy said. The Green Line’s E branch will run to Prudential Station, and then passengers will be diverted to the 39 bus toward Heath Street. After Kenmore Station, the B line will be diverted to the 57 bus McCarthy said. There will be limited bus shuttle service along the C branch on Beacon Street Tuesday. Limited Blue Line service will be available along the entire line without bus connections, McCarthy said. The commuter rail may continue to experience severe delays and cancellations because of the weather, officials said. More information about Tuesday’s service was not immediately available. “Cold and snow are having a big impact on service,” said Mac Daniel, a spokesman for Keolis Commuter Services, which runs the commuter rail for the MBTA. M.G. Lee can be reached at matt.lee@globe.com. Follow him on Twitter @m_g_lee. Aneri Pattani can be reached ataneri.pattani@globe.com. Follow her on Twitter @apattani95.